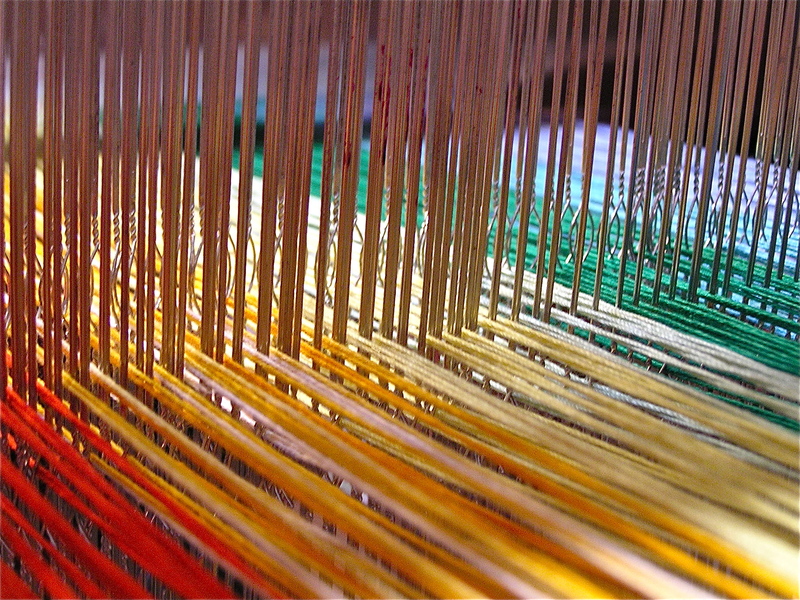 Summer doesn’t always seem to be the most intuitive season for weaving, but we have found that during the heat of the day and amidst all the outside energetics of exploration and adventure, weaving has provided moments of quiet and focus. 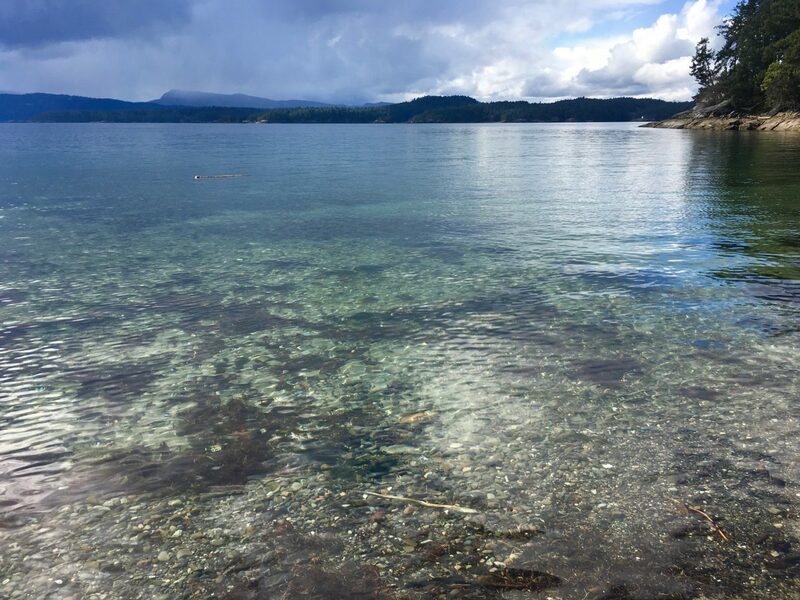 Colour choices reflect the joy of the sun and the lightness of blue skies and beaches. 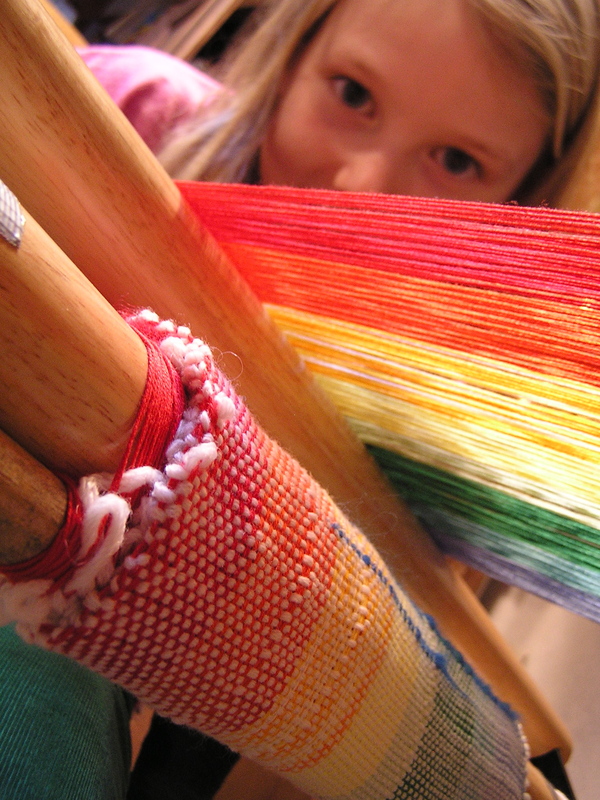 Last month, Taeven was inspired to put a rainbow warp on the loom, so she helped with the math to determine the number of warp strings for each colour to get an overall width, and we used the warping frame to lay it out. It was interesting to have the opportunity to experiment with weaving across a very specific (and bright) set of colours. Taeven chose to use mostly white, with flashes of rainbow roving tucked into the weave as she went. Cedar decided to do the same thing but with black wool. We made each of their weaving long enough to fold in half and stitch the sides up into a little pillow stuffed with wool. 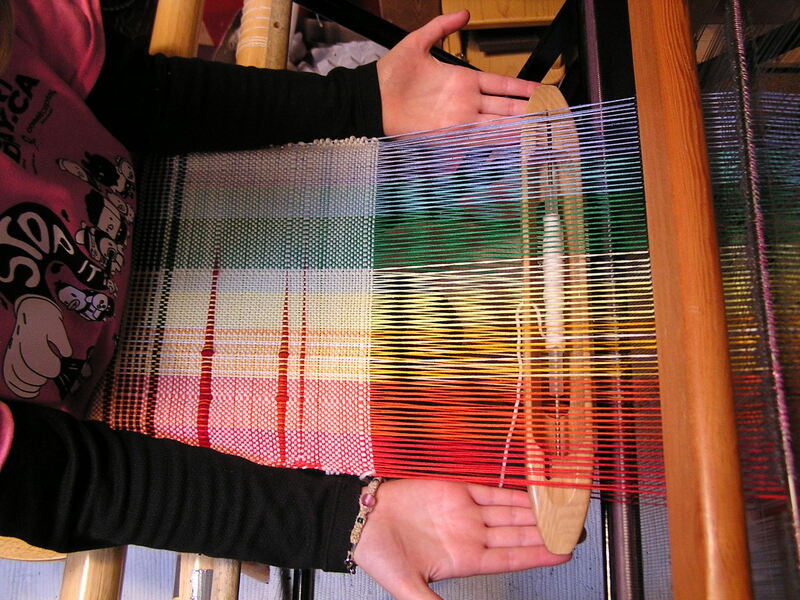 I experimented with using other colours and patterns over the rainbow warp, which was challenging- with so much colour going on in the warp strings, the look of the simple solid colours or white was sometimes all that was needed. Once we used up the rainbow warp, I headed straight to an all white warp! Last weekend, I had the opportunity to show a small collection of weaving in an outdoor art show called “Art In The Orchard”. Over 30 artists from the island set up their diverse forms of art under the old apple trees of Corbett House, a beautiful heritage house and bed and breakfast in the Corbett Valley. From noon until five, the art show saw 250 people come through to see the art, talk to the artists, and relax in the orchard listening to music and watching the goats. I hung my pieces over the clothes line and let the summer sun play with the colours. Unfortunately I couldn’t stay for the day, but I was happy to provide a bit of visual interest hanging in the air for those enjoying the display of abundant creativity. All the best in your blogging, building and other creative adventures. Thanks Paul! It was great to meet you, all the best to you too for creative adventures ahead!